We’d love your help. Let us know what’s wrong with this preview of The Landscapes of Anne of Green Gables by Catherine Reid. To ask other readers questions about The Landscapes of Anne of Green Gables, please sign up. The Landscapes of Anne of Green Gables is a flower lover's delight, a delicious morsel for those who marvel at the wonders of nature. Reid pairs archived images and new color photographs with ephemera from L. M. Montgomery's life to draw surprising comparisons between the budding writer who flourished amid the beauty of Prince Edward Island and the precocious Anne Shirley - one of literature's most beloved Click here to watch a video review of this book on my channel, From Beginning to Bookend. The Landscapes of Anne of Green Gables is a flower lover's delight, a delicious morsel for those who marvel at the wonders of nature. Reid pairs archived images and new color photographs with ephemera from L. M. Montgomery's life to draw surprising comparisons between the budding writer who flourished amid the beauty of Prince Edward Island and the precocious Anne Shirley - one of literature's most beloved redheads - who bloomed from her imagination. Let your mind explore Reid's revelations about Montgomery's life. Let your eyes drink in the glory of daylilies and goldenrod, of birch trees and Queen Anne's lace. Above all, let your heart fill with the majesty of Montgomery's unparalleled descriptions of the natural world. But the most important similarities between Maud of the journals and Anne of Green Gables are those that evoke both passion and solace - an infectious delight in the natural world, a friendship with wild things, a sense of comfort and spiritual renewal in life outdoors, and a belief in the transformative power of the landscape's splendor. Born in the town of Clifton, which is now known as New London, in November of 1874, on Prince Edward Island, Maud Montgomery was not even two years old when her mother died of tuberculosis. Soon after, her father left Prince Edward Island, with a group of families migrating to western Canada. He left young Maud behind with her maternal grandparents. After some time, she went to live with her father and his new wife - a woman who was extremely jealous of her loving relationship with her father, and had no interest in spending time with her stepdaughter. Soon her stepmother had a child, and Maud became the one responsible for cleaning the home, caring for the baby, and more. She was also attending school, and dreaming of Prince Edward Island. The photographs are beautiful, my favourites were Montgomery’s photographs that she shot herself (c. 1917), and many more current ones, showing the beauty of the island, and then there are the ones with landscapes of the beautiful flowers or trees or lanes with quotes from her much beloved books. While this will undoubtedly delight fans of L.M. Montgomery’s Anne of Green Gables, it isn’t necessary to have read her books to appreciate these lovely photographs, or her story. It might also serve as an inspiration to read her books, but for those who have felt they shared a bond with Anne. This book is so much more than I thought it would be. I expected a sort of attractive touristy selection of photos of Prince Edward Island, supported with some text. It turns out that this book is quite an in-depth look at the connection of Lucy Maud Montgomery and her beloved character Anne Shirley with Prince Edward Island. Yes, there are lots of lovely photos of PEI and sites associated with the author's family and the Anne stories, including the Green Gables museum, but there are also images This book is so much more than I thought it would be. I expected a sort of attractive touristy selection of photos of Prince Edward Island, supported with some text. It turns out that this book is quite an in-depth look at the connection of Lucy Maud Montgomery and her beloved character Anne Shirley with Prince Edward Island. Yes, there are lots of lovely photos of PEI and sites associated with the author's family and the Anne stories, including the Green Gables museum, but there are also images and text that take on us a tour through the seasons of the island, particular sites, and their associations with Maud and Anne. These include Maud's personal scrapbooks, journal entries, biographical information, family photos, information about gardens and plants, black and white images colourized by Maude and more. I have been to PEI several times. I've see Anne of Green Gables in several television adaptations and on stage in Charlottetown. I read and loved the Anne series of books in my youth. I thought I knew a fair bit about the place, the author, the character and the books, yet Catherine Reid's book has given me new appreciation for them all. I got goosebumpy a few times while reading it! I read an advance digital copy of this book from Timber Press via NetGalley. Calling all kindred spirits! Did you know that because of the success of Anne of Green Gables the second most successful industry on Prince Edward Island is tourism? Once you look at the gorgeous landscape photography in this book you'll want to book your trip as well. The Landscapes of Anne of Green Gables has plenty of information about Anne's creator, Lucy Maud Montgomery, who preferred to be known as Maud (without an e). You'll gain insight into her childhood and love of Prince Edward Island Calling all kindred spirits! Did you know that because of the success of Anne of Green Gables the second most successful industry on Prince Edward Island is tourism? Once you look at the gorgeous landscape photography in this book you'll want to book your trip as well. The Landscapes of Anne of Green Gables has plenty of information about Anne's creator, Lucy Maud Montgomery, who preferred to be known as Maud (without an e). You'll gain insight into her childhood and love of Prince Edward Island. The quotes from Maud's journal are accompanied by her family photos and pages of Maud's scrapbooks. With personal insights from Maud you'll learn the parallels and differences between her life and Anne's and you'll be granted access to images of the 1908 version of Anne of Green Gables. I felt like I'd stepped back in time while paging through this book. With photos of Prince Edward Island from the late 1800's to today you'll see what's changed and what remains as if time has stood still. I particularly loved seeing the photos of Prince Edward Island throughout the seasons. My favourite comparison photos are of Teapot Rock in the 1890's which, having eroded over time, is now known as Teacup Rock. There's a rustic charm to this book that would make it a lovely gift for lifelong Anne fans who will enjoy revisiting their favourite locations. Thanks to Timber Press, NetGalley, and the author Catherine Reid, for providing an ARC of this book in exchange for an honest review. Honestly, this is a 5-star book for me! My Mom and I shared a love of Anne of Green Gables. We read four or five of the books in the series out loud to each other as I was overcoming a health issue in my early twenties. We grew to love our kindred spirit, Anne. Our love of Anne and her descriptions of PEI prompted a vacation visit to the island. What a wonderful ex Thanks to Timber Press, NetGalley, and the author Catherine Reid, for providing an ARC of this book in exchange for an honest review. Honestly, this is a 5-star book for me! My Mom and I shared a love of Anne of Green Gables. We read four or five of the books in the series out loud to each other as I was overcoming a health issue in my early twenties. We grew to love our kindred spirit, Anne. Our love of Anne and her descriptions of PEI prompted a vacation visit to the island. What a wonderful experience we had driving the red soil back roads, visiting the Anne of Green Gables site, watching the cows graze next to the seashore and having tea in Charlottetown. This book is a wonderful mix of LM (Lucy MAUD) Montgomery biography, Prince Edward Island travelogue, and exquisite photos of those environs. It would be a great gift for an inveterate traveler, or a reader who cherishes Anne. It would also make a nice coffee table book. I loved Anne of Green Gables when I was a child. I felt a real kinship with the red-haired orphan and her wild imagination, and imagined Prince Edward Island as beautifully lush and just as wild as Anne. I've always wanted to travel there to see the island for myself, but haven't had a chance yet. Reading The Landscapes that Inspired Anne of Green Gables, however, gives you a satisfying glimpse of what it's like. There are gorgeous photographs of Prince Edward Island and Av This book was lovely. There are gorgeous photographs of Prince Edward Island and Avonlea, but what I didn't expect was the biography of L.M. Montgomery, and the many similarities between her childhood and Anne's. Reid focuses specifically on the pair's love of nature, and even takes us through different seasons as experienced on Prince Edward Island. This is more than a glossy photography book. It's a homage to L.M. Montgomery and Anne of Green Gables, one that made me nostalgic and even shed a tear or two. I took a few weeks hiatus from reading and came back to finish this lovely book of picturesque settings and glimpses into the past. This would make a stunning coffee table book. Filled with nostalgia, gorgeous pictures, and a brief then and now about Prince Edwards Islands, The Landscape of Anne of Green Gables was idyllic and perfect for a peaceful afternoon read. I especially liked how Reid discusses the parallels between Montgomery's and Anne's disposition and surroundings. It makes me wish I' I took a few weeks hiatus from reading and came back to finish this lovely book of picturesque settings and glimpses into the past. This book is a combination biography, textual commentary, and photographs about the love of nature that L.M. Montgomery and her creation Anne of Green Gables have in common. Any fan of L.M. Montgomery's work will enjoy this book. It manages to weave together the basic facts of L.M. Montgomery's life, from childhood through her sad death, and at the same time evoke happy memories from her novels, particularly the Anne ones. It's not hard to see that L.M. Montgomery found particular solace in the wo This book is a combination biography, textual commentary, and photographs about the love of nature that L.M. Montgomery and her creation Anne of Green Gables have in common. It's not hard to see that L.M. Montgomery found particular solace in the woods, gardens, and landscapes of her home on Prince Edward Island. Passages from her journal confirm that in the midst of any distress, she sought the outdoors. There are some stunning photographs from the island in this book, especially the seascapes. The conclusion of the book becomes ever more poignant as you realize that L.M. Montgomery became an exile from her beloved island after her marriage, a circumstance that likely contributed to eventual overwhelming depression. When combined with her husband's worsening bouts of insanity, the fact that she endured as well as she did is remarkable. While this book certainly delves into both the bitter and the sweet, it does a good job at keeping front and center the landscapes and restorative power of nature that are right at the heart of most of L.M. Montgomery's work. It inspires the reader to look for beauty in the world and treasure it, no matter what. I received an electronic copy of this book in exchange for my honest review. I will most certainly be purchasing my own hard copy of this book! Just for the photographs alone! The pictures of Montgomery and her life, and especially of Prince Edward Island both in her time and in modern days were just stunning! This book made me not only want to go to P.E.I. IMMEDIATELY, but I also plan to find and buy some of Montgomery's journals as well. They are referenced quite a bit in this book, because it t I received an electronic copy of this book in exchange for my honest review. This book made me not only want to go to P.E.I. IMMEDIATELY, but I also plan to find and buy some of Montgomery's journals as well. They are referenced quite a bit in this book, because it talks a lot about her descriptions of the Island as she wrote them in her journals, her life growing up, and the ways in which she was so much like Anne Shirley. I definitely would like to read all of these things for myself. It was very interesting to see the way PEI has changed since Anne and Montgomery's time, and to know that the "modernization" of the Island didn't actually happen until fairly late. This book is a joy for a lifelong fan of L.M. Montgomery like me. It's packed with gorgeous photographs of Prince Edward Island and the historical sites from Montgomery's life and books. Also included are photographs taken by Montgomery and tidbits from her personal scrapbooks alongside plenteous quotes from her works and autobiography. In the last decade or so, producers, authors, and scholars have constantly been taking classic literature (such as Anne of Green Gables) and throwing out their sp This book is a joy for a lifelong fan of L.M. Montgomery like me. It's packed with gorgeous photographs of Prince Edward Island and the historical sites from Montgomery's life and books. Also included are photographs taken by Montgomery and tidbits from her personal scrapbooks alongside plenteous quotes from her works and autobiography. So much of the beloved Anne books is centered upon the land, the scenic landscapes described. These descriptions add poetry and romanticism to the stories. When you read the Anne books yourself, tell me, weren't you inspired by the beauty of Prince Edward Island? It creates the very atmosphere of the story, and if you read between the lines, the elements of nature express and emphasize the plot and emotions therein. Some of this, I subconsciously knew before. After reading this book though, I ha So much of the beloved Anne books is centered upon the land, the scenic landscapes described. These descriptions add poetry and romanticism to the stories. When you read the Anne books yourself, tell me, weren't you inspired by the beauty of Prince Edward Island? It creates the very atmosphere of the story, and if you read between the lines, the elements of nature express and emphasize the plot and emotions therein. Some of this, I subconsciously knew before. After reading this book though, I have keener insight in the lay of Montgomery's land. Reading this book brings out areas of Anne's character too, which I never thought about before, myself... and yet it rings true nonetheless. Her passions (and Montgomery's) are expressed through the moods of the outside world. So many nuances are there in Montgomery's writings, when it comes to her island, but you have to search the pages for it. "It's to the natural world, then, that each girl turns when her soul is beginning to despair. The inspiration found there not only shifts her mood, it changes the very caliber of the writing, the sentences seemingly possessed of a new vitality, bringing readers into a brighter, better place." Such a remarkable and stunning collection of pictures are included; some from Montgomery's private collection (even taken by her own hand); some modern day shots of the bright and colorful landscapes. The red cliffs of P.E.I. just steal the show for me, so beautiful they are in photos. But I think my heart stopped beating, and I may have stopped breathing air for a moment, when I saw an actual picture of Lover's Lane in the 1920s. I think you'll feel the same way. This book feels magical. I think it could be a balm for a hurting heart. You're seeing fictional places out in the real world (they never were "fictional" anyway). Lover's Lane, the Lake of Shining Waters, the White Lady... and it all increases my desire to visit these landmarks myself. There is so much good-feeling nostalgia locked away in this volume. You must get it for yourself! I'm so glad to have gone on a tour via the vehicle of a book -- armchair travel. It will suffice until I go to P.E.I. to take it all in myself in person, some blissful distant day. "I had... then as now, two great refuges and consolations -- the world of nature and the world of books. They kept life in my soul; they made me love my home because of my dreams and rambles and the deep joy and delight they gave me -- because of the halo they threw over what was otherwise bare and savorless." Sheer joy! If you love Lucy Maud Montgomery and flowers, trees, nature, history-you are going to love this book. It is magnificent! As many of my friends and followers know, I retain an almost irrational love for Anne of Green Gables, decades after first reading the books one summer, returning to school, and finding that my bestie SleepingKoala45 (Wishful Thinking) had been on the exact same kick. (This was in the days before email and cell phones and stuff, people) SK45 and I spent hours... no days... no weeks... talking about th I received an Advance Reader Copy of this book from Net Galley in exchange for an honest review. As many of my friends and followers know, I retain an almost irrational love for Anne of Green Gables, decades after first reading the books one summer, returning to school, and finding that my bestie SleepingKoala45 (Wishful Thinking) had been on the exact same kick. (This was in the days before email and cell phones and stuff, people) SK45 and I spent hours... no days... no weeks... talking about these books and analyzing characters in them. Okay, honestly, we still sometimes talk about these books. Lucy Maud Montgomery was the reason why, at the tender age of 13, I wrote my first letter to a publisher, seeking a copy of LMM's The Road to Yesterday, which had been published in a vanishingly small print run, after an editor at McGraw-Hill Ryerson wrecked the volume by chopping it to pieces, eliminating half the source material. (FYI #1, they sent it to me with a bill for $4, which I paid and still have folded in the book. I can't believe back in those days how people trusted you to pay after you received the merchandise. Or that a hardback book was only $4! FYI#2, that book was re-released in 2009 in full form as The Blythes Are Quoted.) When I say irrational love, that has to do with some of the same flaws in LMM's books that one sees of other books of the period (racism, sexism, tropes about relationships, etc.). Yeah, it's kind of odd given what an ardent feminist and civil rights supporter I am but I loved this series and felt like I watched Anne go from my age to adulthood and it was thrilling. (Plus, come on, they're more than a hundred years old and even much older Shakespeare has these same flaws. And no, don't say I'm comparing them like equals. Sigh) But I digress. Much more than I imagined, this book takes you far beyond the 'Landscapes of Anne of Green Gables'. Almost immediately the author draws your attention to the connection between Anne & Maud herself. I would suppose that Diana Barry & Anne Shirley were not the original 'kindred spirits', but rather Anne & Maud are. There is much to learn about the similarities of the circumstances and upbringing that Maud endured. Despite not being totally orphaned and being raised by extended family, Much more than I imagined, this book takes you far beyond the 'Landscapes of Anne of Green Gables'. Almost immediately the author draws your attention to the connection between Anne & Maud herself. I would suppose that Diana Barry & Anne Shirley were not the original 'kindred spirits', but rather Anne & Maud are. There is much to learn about the similarities of the circumstances and upbringing that Maud endured. Despite not being totally orphaned and being raised by extended family, it's clear to see that she has written about her own experiences. Creating alternate characters to the harsh ones she's left to live with, are, what made the more idyllic life in her mind and evidently found amongst the pages of her novels. Of course there are numerous photographs of Prince Edward Island today. Tourism being its number 2 industry, fueled by the popularity of L.M. Montgomery's famous series, beginning with 'Anne of Green Gables'. While it explains that commercialism has replaced much of the natural and original beauty of the Island, it seems that PEI still maintains enough charm to draw the crowds. Maud documented her life through her journals and scrapbooks and many of her own photographs are included in this book. Most visitors flock to the Island during the warm summer months, and they rarely experience the broad variety of the seasons on PEI. There is a whole chapter devoted to the array of beauty each season brings, and I think it may be my favourite. It is no surprise that Anne herself declares "I'm so glad I live in a world where there are Octobers"!! Just stunning and beautiful. The natural world around her, the woodlands, gardens, broad fields, quiet dirt road lanes and the beauty of the coastline leaves no doubts that this influence on her life was her core source of inspiration and peace. It shines through in her writing, and again, another indication that Anne's character is based so heavily on her own life. A real joy to read, this would make a beautiful gift to any 'Anne with a e' fan you know. A lovely book for every reader (like me) who felt she and Anne are kindred spirits. I enjoyed so much re-visiting the Anne of Green Gables stories through this book as well as seeing the pretty landscape of Prince Edward Island for the first time. The addition of biographical details on the parallels between Montgomery and her character was also quite interesting. All fans of L.M. Montgomery's work will enjoy this book and everyone who wants to visit PEI will be inspired by the gorgeous photos. A lovely book for every reader (like me) who felt she and Anne are kindred spirits. I enjoyed so much re-visiting the Anne of Green Gables stories through this book as well as seeing the pretty landscape of Prince Edward Island for the first time. The addition of biographical details on the parallels between Montgomery and her character was also quite interesting. All fans of L.M. Montgomery's work will enjoy this book and everyone who wants to visit PEI will be inspired by the gorgeous photos. I borrowed this book from the library with the intent to flip through the photos as a reference, but ended up reading it cover to cover because it was so intriguing! I have long been interested in L.M. Montgomery's life and the interweaving of fact and fiction shared between her and her most well-known heroine, Anne. I already have Prince Edward Island on my bucket list, but it has bumped its way up after reading this book. With gorgeous photos depicting Prince Edward Island's rolling hills and I borrowed this book from the library with the intent to flip through the photos as a reference, but ended up reading it cover to cover because it was so intriguing! I have long been interested in L.M. Montgomery's life and the interweaving of fact and fiction shared between her and her most well-known heroine, Anne. I already have Prince Edward Island on my bucket list, but it has bumped its way up after reading this book. With gorgeous photos depicting Prince Edward Island's rolling hills and seaside brilliance and noting areas near L.M. Montgomery's relatives' home that inspired the beloved scenery in the novels, including the Lake of Shining Waters, Lover's Lane, and of course, the iconic Green Gables itself. I enjoyed finding out about the similarities between Maud and Anne, but was sad to read the heartbreaking story of Maud's later life, including a marriage to a difficult man and long battle with depression and life disappointments. If you are like me and would love to visit PEI and discover first-hand the landscapes of Anne of Green Gables, but cannot do it anytime soon, this is the next best thing. A simply beautifully illustrated book - one to cherish for any true Anne fan. Reid takes us into the life and work of beloved author Lucy Maud Montgomery and how Prince Edward Island inspired the author. The accompanying photographs are an homage to the author and the island. I consider myself at least a mild fan of Lucy Maud Montgomery and of her writings , for like her and like many of her characters I am a high-strung and sensitive person who feels compelled to write, has a deep appreciation of creation, and comes off to others as far more optimistic than I feel inside. In short, I found this book deeply relatable and wanted to read it on those grounds. Having read it, I must say that the book ends up being far better than I expected it to be, and I had high hopes and expectations going into it. A big part of the reason for that is that the landscapes that the author talks about are multi-layered. I knew, going into this book, that it would have beautiful landscapes of Prince Edward Island, just from the context I brought with me being familiar with Montgomery's life and writings, but I was not aware that the author would talk about other landscapes as well, including the landscapes of time and the interior landscapes of creativity and inspiration. All of this made a great book even better. In terms of its contents, this book is about 300 pages but it can be read profitably and well more easily than others of its size because of a great many gorgeous pictures that will make this book a treasured volume on coffee tables and in bookshelves for a great many people for a long time to come. The book is organized in a way that puts its gorgeous photos and the author's text in the best light, being divided into thematically organized chapters that discuss such matters as an introduction to Prince Edward Island and its history, the interconnected lives of Anne of Green Gables and Lucy Maud Montgomery as kindred orphans, the loveliness of Prince Edward Island during Montgomery's time and our own, the poetic imagination of both Montgomery and her protagonists, the beautiful gardens of Montgomery's imagination and life, the seasons of life on Prince Edward Island, and the life of a writer. There is a great deal in these materials that is personally relevant and that will likely be relevant to many of this book's readers, whether or not they have visited PEI. If this book wasn't supported by the tourism board of that lovely island province, it needs to be soon. There are many ways that you could like this book. You could be a fan of Anne of Green Gables or the other writings of Lucy Maud Montgomery, and be interested in knowing more about her writings and the land that inspired them. You could be a fan of Prince Edward Island and its natural beauty as well as its unusual history that has led to much of that beauty being preserved even in the face of tourism and the proliferation of golf courses. You could be a fan of the relationship between the beauty of creation and its influence on the artistic creation of writers. You could be a fan of nature photography or beautiful book art, or any number of related subjects, and there would be much to enjoy in this book. This book combines the immense beauty of Prince Edward Island as well as the writing of Lucy Maud Montgomery with the immense tragedy of a life marked by powerful depression and immense difficulty, and the lasting nature of the beauty of the land as well as the writing that was related to a life that in many ways deeply resembles my own. After all, Montgomery was a sensitive and high-strung person with a marked tendency towards melancholy who channeled her intense passions and the difficulties of her life into writing which has served the world far more than it served her personally. This book is a worthy and gorgeous testament to that reality. Anne of Green Gables fans: take note of this book. Filled with colorful photographs of Prince Edward Island, this book takes readers to the island made famous by Lucy Maud Montgomery and her cast of strong female characters. Reid uses the text to compare and contrast Montgomery’s world and Anne’s world, linking personal similarities between Montgomery and Anne. Readers can also step into various museums and historic sites dedicated to Montgomery and the Cuthberts, thanks to numerous interior photographs of these locations. The inclusion of Montgomery’s own photographs of landscapes and nature at the turn of the twentieth century adds the perfect element to this book. When I first went to London, I expected to see the London of Peter Pan, and Mary Poppins. But even 40 years ago, that London had long gone, destroyed by time, and WWII bombs. There were bits, bits, where you could see the old London, but they were far and few between. Sometimes great stories, set in areas will have to be visited only in your head. Just as the Los Angeles of Raymond Chandler has long since vanished. For the lucky ones, for the ones that wanted to preserve the land that inspired th When I first went to London, I expected to see the London of Peter Pan, and Mary Poppins. But even 40 years ago, that London had long gone, destroyed by time, and WWII bombs. There were bits, bits, where you could see the old London, but they were far and few between. Sometimes great stories, set in areas will have to be visited only in your head. Just as the Los Angeles of Raymond Chandler has long since vanished. For the lucky ones, for the ones that wanted to preserve the land that inspired their writing, so that future readers can find that special place, there are some authors, and some lovers of writers that preserved the land, the way the Beatrix Potter bought up much of the Lake District, so that visitors can see where she lived, and where her characters wandered. So too, by luck or by will, the land that the author of Anne of Green Gables and many other books set on Prince Edward Island, has been preserved, in spots. Visitors may not see exactly the things that Maud saw, when she was coming up with her stories, but buildings, shorelines, and fields are still there, and you can visit the house that inspired Green Gables, and see the beach and the forests. And this book shows all of those things, all the beauty now, and then, with photos from Maud's collection of the houses she lived in, and the fields she loved. But it is not just a book of lovely pictures, although I suppose you could skip the writing to just look at the landscapes. But this is also explains why the garden, or the field or the building was significant. And what Maud had to say about it, either in her journal, or in her story. Nicely researched, easy to read, beautiful colors. If you love Anne of Green Gables I would suggest picking up this book. 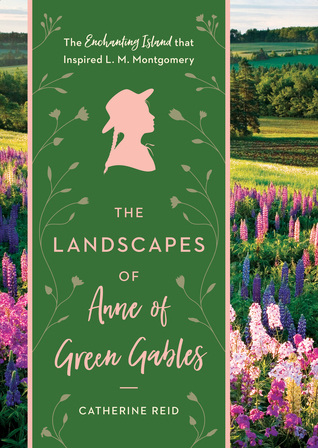 The Landscapes of Anne of Green Gables explores the real-life landscapes of Prince Edward Island that have influenced Lucy Maud Montgomery, as well as her connection to nature and the way she saw it. Catherine Reid also examines the similarities between Montgomery and Anne Shirley, as well as her other heroines briefly. She gives an account of L.M. Montgomery's life that is short yet it gives enough details to have a comprehensive idea of it. This book is an absolute delight and a must-have. The The Landscapes of Anne of Green Gables explores the real-life landscapes of Prince Edward Island that have influenced Lucy Maud Montgomery, as well as her connection to nature and the way she saw it. Catherine Reid also examines the similarities between Montgomery and Anne Shirley, as well as her other heroines briefly. She gives an account of L.M. Montgomery's life that is short yet it gives enough details to have a comprehensive idea of it. This book is an absolute delight and a must-have. The writing is enhanced by modern colour photographs, but also by older black and white as well as coloured photographs, most of them taken by L.M. Montgomery. We're also treated to a few pages of her scrapbooks. It was such a pleasure to explore the landscapes of Prince Edward Island and feel the world of Green Gables come to life. I was given a digital copy for review, but I will buy a hard copy so I can look at it often. It's now part of my favourite books and one that will stay with me. I think even someone who isn't necessarily a fan of Anne of Green Gables would enjoy looking at the magical images of wood walks, cliffs under the snow and colourful flowers. It's a feast for the eyes and really is a great homage to L.M. Montgomery's work. You can almost hear Anne admire the world around her as you read The Landscapes of Anne of Green Gables. Disclaimer: I received a free digital copy of this book in exchange for an honest review. Thanks to NetGalley and Timber Press. "The Landscapes of Anne of Green Gables" is a wonderful reading experience. One part nature photography, one part biography, and one part literary examination-this book is beautifully written and accompanied by often breathtaking images of PEI. I thought it was a perfect accompaniment for anyone that has spent time imagining the hills, flowers, and lanes Anne Shirley (L. Maud Montgomery) describes as she flabergasts Marilla and Mathew with her exuberance and imagination. Catherine Reid expertly "The Landscapes of Anne of Green Gables" is a wonderful reading experience. One part nature photography, one part biography, and one part literary examination-this book is beautifully written and accompanied by often breathtaking images of PEI. I thought it was a perfect accompaniment for anyone that has spent time imagining the hills, flowers, and lanes Anne Shirley (L. Maud Montgomery) describes as she flabergasts Marilla and Mathew with her exuberance and imagination. Catherine Reid expertly integrates current photographs, archival photographs taken by Montgomery, quotes from Montgomery's novels, and quotes from Montgomery's own journals to create a book that brings to life the world of L. Maud Montgomery. It was wonderful to read how, even though she claimed to not use herself (or any real person) as inspiration for her novels, Lucy Maud Montgomery actually brought her own love and desire to be with and in nature into her stories. I was also surprised to see that even though time has allowed for progress to alter parts of Prince Edward Island, there are so many places that have been preserved and reserved because of the influence of L. M. Montgomery. I would recommend this to those that enjoy nature photography and L. M. Montgomery fans. 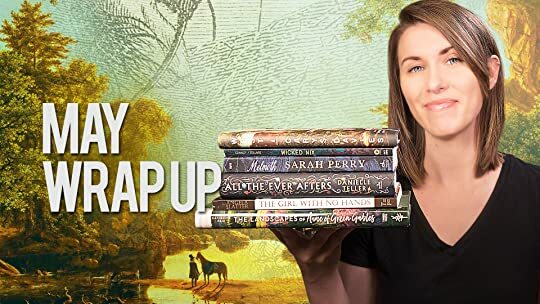 Bursting with photos and writings from the journals and scrapbooks of Lucy Maud Montgomery, as well as quotes from her many works of fiction, this books presents the deep connection between this author and the natural world. As an adult who still enjoys rereading the volumes about Anne Shirley, this was an amazing exposition of how the author's childhood experience and worldview shaped her writings. The photos of gardens, scenic vistas, and the restored and reconstructed locations reminded me th Bursting with photos and writings from the journals and scrapbooks of Lucy Maud Montgomery, as well as quotes from her many works of fiction, this books presents the deep connection between this author and the natural world. As an adult who still enjoys rereading the volumes about Anne Shirley, this was an amazing exposition of how the author's childhood experience and worldview shaped her writings. The photos of gardens, scenic vistas, and the restored and reconstructed locations reminded me that Prince Edward Island has a deserved place on my bucket list for future travel. I can’t get over how much I loved this book—I picked it up and thought I’d read just the first couple paragraphs but couldn’t put it down! It brings together snippets from Montgomery’s books, the illustrations from Anne of Green Gables, Montgomery’s personal journals, and colorful photography of lush Prince Edward Island. Truly wonderful! What a great title for an amazing place on earth. This book shows and describes the wonderful landscape that Lucy Maud Montgomery and Anne of Green Gables lived in. I read all of the Anne of Green Gables books when I was younger, and this book not only showed up the beautiful landscape, but made me realize that Anne was patterned after Lucy Maud Montgomery's life. Thank you for such a beautiful book! I will be ordered it in hardcopy when it comes out. It is a keeper. Entirely lovely and absolutely beautiful. Anne Shirley dominated by childhood -- I voraciously read the books and I'm sure we watched the eighties tv films dozens of times -- and this gloriously nostalgic and loving entry into the beauty of Prince Edward Island and the life of author LM Montgomery was a delightful step back into Anne's world. I will note the writing and photos were strangely repetitive at times -- surely we don't need to see three versions of the same pot of geraniums? -- but no Entirely lovely and absolutely beautiful. Anne Shirley dominated by childhood -- I voraciously read the books and I'm sure we watched the eighties tv films dozens of times -- and this gloriously nostalgic and loving entry into the beauty of Prince Edward Island and the life of author LM Montgomery was a delightful step back into Anne's world.